N.B. I will do my best not to reveal anything here that a person wouldn’t learn from reading the back cover of the book or the first few chapters. 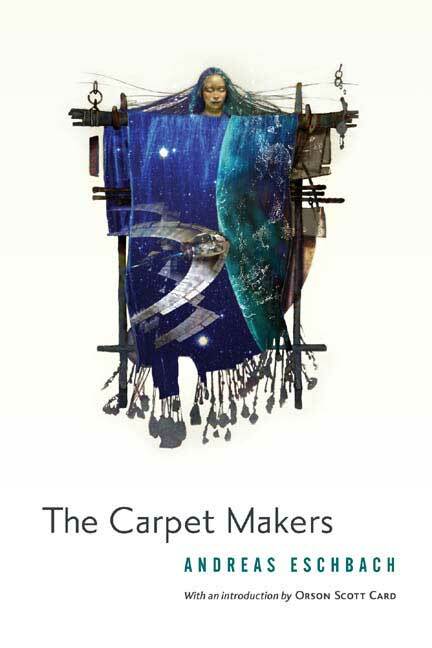 Andreas Eschbach’s book The Carpet Makers (Die Haarteppichknüpfer) is a German science-fiction novel first published in German in 1995 and translated into English by Doryl Jensen in 2005. The story centers on a somewhat mysterious Emperor Cult / Guild known as the carpet makers. Carpet makers, always men, work their entire lives to create a single work of art: a carpet roughly the size of a man intricately knotted together out of the hair of their wives (they practice polygamy) and daughters. Once completed, the craft is handed down from father to son. These carpets, which seem to drive the entire economy of this planet, are destined for the Imperial Palace on a distant planet that no one has ever visited for the glory and honor of the God-Emperor. This tradition has been going on for thousands of years. So long, in fact, that no can remember how or why the tradition was begun. But there are rumors circulating that the Emperor has abdicated, or worse, been killed (hardly something that can be believed of an immortal being). Numerous questions arise about the nature of the hair carpet practice and what it might mean for entire galaxies who have worshiped an immortal Emperor for thousands of years to be suddenly Emperor-less. These are the central tensions of The Carpet Makers. The great strength of The Carpet Makers rests in the manner in which the story is told. Each chapter focuses on a single character and never repeats a character so that the book could be seen as a series of short stories. Yet these stories are all connected. In the first half or so of the book, each chapter jumps slightly forward in time from the previous chapter, but always circles back to connect with the central character of the previous chapter so that the book itself appears as a kind of carpet with interlocking knots. This structure loosens a bit as the book progresses, which mirrors the overall unraveling of the world within the narrative. The weakness of The Carpet Makers is well, the answers to the questions, and it does give us answers. I’m sure that some will find the secret of hair carpets wickedly clever, but I found it merely wicked. The whole book leaves one with a sense of meaningless about life: one long useless task that, in the end, signifies nothing (as Shakespeare put it). One cannot help make the connection between the emptying of the Universe of the God-Emperor with Nietzsche’s death of god. But even Nietzsche’s will to power alternative is seen as fruitless in the end. Even this won’t give us meaning. The Emperor can’t, our labor can’t, what can? The Carpet Makers offers no answers that I can find. If that’s the point of the book, it does not resonant with reality. The Carpet Makers offers a skewed understanding of man’s relationship to God, even if it accurately portrays a Universe without God. But the Emperor isn’t God, and surely it is true and good to be reminded that we should not worship the creation rather than the creator. But that is not the message of The Carpet Makers. In The Carpet Makers, even if God exists, life is meaningless because God is merely an immortal man consumed with a thirst for power.